If you're having lunch, you might want to put it aside for a moment, because this story gets pretty disgusting fast. 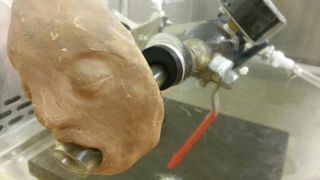 North Carolina State University epidemiologists have put together a homemade machine that simulates the process of vomiting. The goal is to test whether human norovirus spreads when people chunder. It's long been suspected that this is the way the virus gets from one patient to another, and now Grace Tung-Thompson and her team are testing that hypothesis - using vanilla pudding in place of real vomit. "When one person vomits, the aerosolized virus particles can get into another person's mouth and, if swallowed, can lead to infection," said Lee-Ann Jaykus, who also worked on the research. "But those airborne particles could also land on nearby surfaces like tables and door handles, causing environmental contamination." Early results from the machine, published in PLOS ONE, aren't good news for the squeamish. "At most, only 0.02 percent of the total virus in the vomit was aerosolized," Jaykus says. "But that can still amount to thousands of virus particles – more than enough to infect other people." Next, the team plans to assess how long those virus particles stay airborne and how far they might be able to travel. In the meantime, better go wash your hands, yeah?